I love the graphics Google comes up with… apparently fog means there might be lurking zombies in the sky, or, maybe there are two suns? 10 4 april1, originally uploaded by katymac79. Easter this year was so much more awesome than last year. We had a fabulous weekend! I had Friday off, and nothing makes weekends better than not loving your day job, so I had a great list of things to get done and I was very happy to have an extra day to do it. Naps got a bit fubar, basically they took turns but that actually worked out nicely. Zoe morning nap equaled quality car cleaning time for Niamh and I – the most odd thing to be found was a tube of baby toothpaste. The winter stock pile of stuff needed a clean sweep and we got it done pretty well. Niamh lost interested in actually helping in the second round – she found a lolly pop (wrapper intact) and that was the end of her ability to focus on non lolly related items. She was very cute sitting in the drivers seat talking away while I ferretted out all the junk. The cars look 100% better but both need some time with a vacuum. During Niamh’s nap Zoe was awake and we ran errands; bank, post office, Ace hardware, and target – you know, the usual… We got home just in time for Zoe to drift off and Niamh to wake up. Not to box Zoe out, but, it was a lot easier to do Easter eggs with just Niamh. She was very interested in the glue and sequins and glitter that came with this package. She would have played for hours if we didn’t run out of glue; note, gorilla glue is not a good sub for elmers. Note #2 – need elmers glue on hand… I felt bad doing it without Lars too because he really does like it but work ate him all Friday and Saturday. By the end of the day I needed a break and we went up to friends house and had a nice time visiting. Saturday was gray and yucky and Lars was still neck deep in work but I timed nap for Zoe perfectly to cover my trip to sign the lease for parents investment. The tenants are very nice and love the place and all went very well. I still have one or two last details but I’m glad that project is basically wrapped. By the time I got home Niamh’s brain was running out her ears from Dora overdose but an occasional tv babysitter can’t be helped. It felt silly to call a real sitter for the hour I would need. The fun project of the day was cupcake making, I got one of the seasonal mixes with cool sprinkles and we had fun making them. Note#3 I need another cupcake pan – all mixes make more then the 12 I have space for. This was in a way a trial run for Zoe’s birthday since cupcakes with fancy icing are going to be the goodie bag. I also have cute cupcake boxes to put them in and since we had 20 fancy cupcakes and only 4 people we brought 4 over to our neighbors and left them on their doorstep. Hopefully they, not random animals, got them but they were gone in the morning when I looked. Saturday night I did all the baskets and we decided to leave them on the coffee table to be found. I also boiled 4 more eggs so Lars could color them and use the ‘shiny’ kit he picked. We put these special eggs into the baskets and Niamh did not disappoint, she knew they were not ones she did so the Bunny must have brought them for her. Sometimes things just work out. Easter morning Niamh finds her basket and is very excited over everything. Lars goes back to bed and I referee early morning candy eating, breakfast, and getting dressed for church. Josh, Zoe’s godfather, took his duty seriously and he and Karen came to church with us and they weren’t even late. We got our front row seat with all the lovely old ladies who like to watch Niamh and Zoe. It is technically a handicapped section so it is always open and since we get there about 5 min before mass starts I don’t feel like I’m stealing their seat. Niamh is much better behaved when she can see and it is nice to have no kneeler in front of me so Zoe has a tad more space. If people are judging me in church they are atleast keeping it to themselves. Really, Niamh was very good and other then missing her nap Zoe was good too, and, she was asleep before we got out of the parking lot. Josh and Karen stayed to watch egg finding and either Lars remembered me being mad last year or he was more interested this year but he did a far better job of actually hiding eggs (and putting on coffee). Niamh was vibrating with excitement, she loved finding eggs. 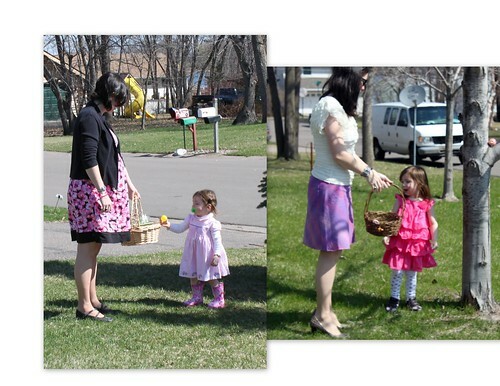 Zoe slept through it but when she did wake up Niamh helpfully re hid all the eggs for Zoe to find. She would have rehid them all day long if we let her, I’m glad I had plastic eggs on hand to sub in when the real eggs started looking rough (and we wanted to make lunch). Brunch was just us but it was nice and then we all napped until 2. Since the day was awesome we walked to the park and played for over an hour. We put a roast and potatoes in the slow cooker so we ate as a family at 6. Dinner conversation was more focused on Disney princess hair colors then the normal religious/political discussions normal at my greater family gatherings but it was a good family dinner. We finished the evening with a trip to the hot tub followed by wine and chocolate bunny while we watched the end of season 2 of Sons of Anarchy. Woke up this morning wishing it was not a work day but it was a great weekend. Walking!, originally uploaded by katymac79. She always picks days she is wearing something stupid to do milestones. Yesterday Zoe took 3 steps in a row, more then once, so I call that walking. This weekend was packed to capacity. We started out with a vague plan to go to the Zoo for farm babies but once the weather rained on our parade we decided that we would check out the children’s museum since it came highly recommended…. Then a tenant fell from the sky so full speed ahead on house prep. Friday night I folded a ton of laundry while Lars was at practice – a nice little bit of found time since our normal Friday plan is to go to practice with him and hang out with the other wives and children but there was a virus to be avoided so we stayed home. To make up for it I let Niamh stay up to watch a movie and we watched ‘Flushed Away’. I think she enjoyed it but she was pretty tired by the end. I know she enjoyed extra momma snuggle time. Zoe does not really watch tv nor does she do well with missing her bed time so she was snoring away on time. Lars ended up watching the 2nd half of the movie with us and we both felt the adult jokes were good but we are unsure if there is enough in it for Niamh to want to watch it again. Since there were no princesses, mermaids, or Dora it isn’t likely to make her repeat list. Oh, aside, Niamh is now into Blues Clues – a nice change from Dora and Diego. The funny thing is Blues clues uses a paw print to indicate a clue and while she has only watched maybe 5 episodes she has internalized this factoid and every time she sees a printed paw print she yell’s “Clue!!!”. Thank you Iams and Garanamls brand for including clues all over your packaging! Anyway – after #1 was tucked in bed we perused our Netflix instant queue and decided we would finally start Sons of Anarchy since we finished all of Bones. SoA is highly recommended but in the future I will be cognizant that the people who recommended this are also people who like guns. The first two episodes were…. Compelling. They were very violent and very sad but also very engaging and I wanted to know what happened. We stayed up until 2 am watching 4 or 5 episodes and we only stopped because I fell asleep. My vision of a motorcycle rider is the guys I know from work, nice regular guys, the show is definitely not that. We have watched it nightly and it is full of really good characters so I can recommend, but, know it is violent and over the top. You would think after 5 seasons of Bones my gross factor would be super high but they are clinical and scientific bodies, totally different. Saturday I spent a big chunk of time working on the town house because we had a very interested party coming at 1pm – I did an hour and a half, then ran home to help with kids and lunch etc and then they went for naps and I went back for more work and the official showing and then home again to join Lars post nap. We played around the house and did a few little things and after bedtime I went back to the house to do more. That was a lot of little trips, good thing the place is only a mile away. The people really liked it and I’m waiting on signatures but it is as good as done. That is a good thing, but, it also means getting all the little things squared away asap. Sunday we went to the children’s museum. It was ‘ok’ not as fantastic as everyone says. I don’t know what I was expecting and we actually didn’t get to every section but it really just seemed ok. We ended up randomly picking the one day a month it is free so that was nice, but, it might have also been a contributor to the crowds. We did lunch and headed home for nap, afternoon fun, dinner/bath/bed and then back to the house I went while Lars cooked dinner. I got most of the tasks done and I still have a few little things but they are falling into place. Good thing this is the final mile on this project, it will be nice to just have it finished. This weekend is Easter and we are going to be very low key. Egg coloring on Friday since the kids and I both are off. Easter Sunday trip to church then an egg hunt and possibly brunch with a few friends. Nobody here is religious and nobody is really doing anything so we will do our own little celebration and maybe webcam Easter dinner with the family. Other grand plans for the weekend include invitations for Zoe’s first birthday, getting the guest room in shape for guests, and if the weather is nice setting up the swings. I try to keep my blog mostly pleasant and positive but this is a frustration I want to share. Apparently I am crippled by options for carseats to the point that I can’t figure out what to get. This happened with Niamh’s ‘big girl’ seats, I agonized over Zoë’s baby bucket and now I’m back in the same boat again! Zoe needs a new car seat, she is outgrowing the bucket and while I think she will make the month, she won’t last much longer. I actually have half the solution already, (I think) we are going to buy another Evenflow Symphony, the one we have is still going strong with Niamh; it still fits her comfortably and after many washings the cover looks decent. We also love the sure lock system because it makes installing it in grandma’s car super simple. The pink Graco does NOT really fit Niamh anymore. She can live with it but the logical solution is to pass the Graco to Zoe and Niamh something new. First thought was another Evenflow, but, they are $200 and while they do convert to a booster the cost has a lot to do with the baby features and we definitely don’t need that for Niamh. Now I’m looking at booster options like this. She is over 25lb (31 to be exact) so legally she can use this but my goal is to have a replacement for the Prius seat because we seldom do long trips in the Prius and now I worry that she will like this booster better! Would I do better to just get two new boosters for Niamh and both of the car seats move over to Zoe? Then I start thinking travel, first, lugging two of the big evenflow’s will be a pain but the boosters don’t have sure latch (why I don’t know! That is the only feature I’m sure of). Should I just get another booster to keep at my mom’s? Then there is the next step up of boosters that don’t have the 5 point restraint, they are for kids 30lb and up. I feel less good about that option since we are so close to the line but it’s nice that the back comes off later and there is just the seat booster. How many car seats will we end up owning? I’m totally over analyzing but I want to make good decisions based on safety and price and comfort and ease of use…. Too many variables! In the end, I close the search window and decide to come back to it another day.